Franklin Cox is an indefatigable and prolific figure, both as a performer and as a musicologist. 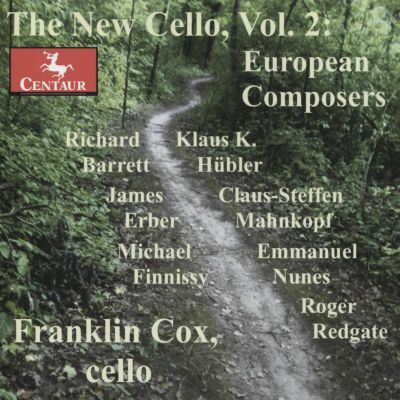 This, the second volume in his “New Cello” series, focuses on European composers. Using Klaus Huebler’s Opus Breve as a refrain, this rondo of nine performances encompasses a great deal of what’s happening in second modernity. Particularly fine are the brief but richly detailed Dove’s Figary of Michael Finnissy, Richard Barrett’s 2-bowed essay Dark Ages, and Claus-Steffen Mahnkopf’s La vision d’ange nouveau. The latter piece is based on an essay by Walter Benjamin written in response to a work by Paul Klee. It is not only rich in literary allusions, but multifaceted in its musical reference points as well, ranging from hyper-virtuosity to string effects to linear and rhythmic polyphony. Cox makes these pieces sound, well not easy, exactly, but more attainable than they truly are by lesser cellists. Still, if that helps them to secure a foothold in the contemporary cello repertoire, even with many hours spent in the practice rooms to obtain it, so much the better.